Theresa May is the huge odds-on favourite to be the next PM after the General Election this Thursday. Are you betting on the elections? 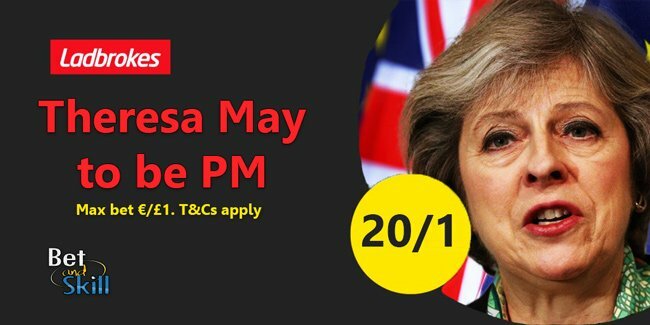 Ladbrokes are offering a tasty 20/1 on Theresa May to be the next Prime Minister! Hurry up! All major bookmakers have the Tories heavy odds-on favourites to win both the most seats and an overall majority. Theresa May is normally backable at 1/6 to be the next UK Prime Minister after the General Election on 8th June 2017! Get the best odds on the Internet at Ladbrokes - 20/1 Theresa May to be the next PM! Join Ladbrokes via our special links and claim 20/1 for Theresa May to be the next Prime Minister! 3) Place a single bet of up to €/£1 on Theresa May to be the next Prime Minister in the '2017 UK General Election' market before the kick off. 4) If Theresa May is the next PM, your account will be credited with extra winning to make payout equivalent to enhanced odds within 24 hours. 4. This offer is available from 5pm on Sunday 4th June 2017 until 1pm on Thursday 8th June 2017. "Get 20/1 Theresa May to be Prime Minister at Ladbrokes (General Election enhanced price)"